California has Coachella. Glastonbury has, well, Glastonbury. And Montreal? We've got Osheaga, a three-day summer smorgasbord of the music industry's hottest acts, from indie to top 40. In 2017, Osheaga runs from August 4 to August 6, 2017. A music festival held in Parc Jean-Drapeau every summer since 2006, Osheaga is usually scheduled in late July and/or early August and lasts three days - three days of trending musical properties from the established to the emerging often playing at the same time but spread out across the grounds, part and parcel of Osheaga's charm. As with other major international outdoor music festivals, attendees can discover dozens of acts in the course of one day, sometimes three or more in the span of one hour with booked talent often overlapping each other's stage time. As for the crowd, Osheaga attracts roughly 135,000 people over its three-day run, a huge leap from its 25,000-person debut in 2006. 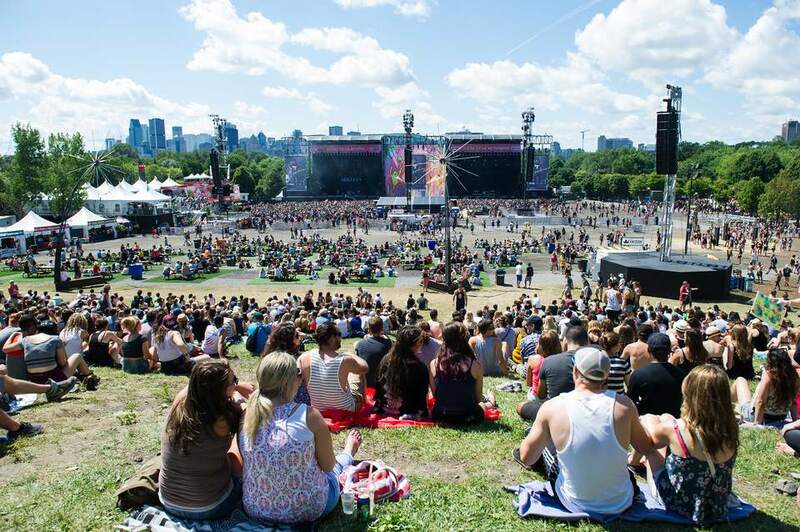 From why is the festival called Osheaga to where to stay if from out of town to what to bring and not bring on festival grounds, find out everything you need to know about attending one of Montreal's hottest music events by scrolling below. Headliners and the bulk of Osheaga's booked artists are usually revealed some time in March or April. Three-day festival passes typically go on sale around the same time and one-day passes can be expected to become available as of May. In 2017, admission for three-day festival passes range from $320 to $1150. One-day passes range from $120 to $235. Taxes and/or service charges may apply. Buy tickets. What does Osheaga mean exactly? According to festival organizers, the word “osheaga” has First Nations roots, as per Mohawk oral history. Festival organizers claim famed explorer Jacques Cartier first met members of the tribe near what's now called the Lachine rapids and he was apparently waving his hands around. They say it was unclear if he was trying to shake their hands or inquire about the rapids so the Mohawk tribe members, confused, allegedly looked at each other and said "o she ha ga," which fest organizers claim is Iroquois for “people of shaking hands.” Meanwhile, they say Cartier thought that "o she ha ga" meant large rapids, the possibly first of a long series of language and cultural misunderstandings between Europeans and First Nations. Yet other sources claim that members of the tribe exclaimed ''oshahaka,'' or ''people of the hand'' to describe what they saw as the white man's unusual fixation on shaking people's hands when they greeted. And yet select historians think that ''osheaga'' derives from Hochelaga, or vice versa. Hochelaga was, at the time of Jacques Cartier's arrival during his second voyage to the part of the New World in what is today's Quebec, a sixteenth century Iroquois village which Cartier visited on October 3, 1535. Some linguists think the word Hochelaga is a French mispronunciation of an Iroquois word. That word, according to historians, is ''osheaga.'' And they claim it's Iroquois for ''big rapids,'' contradicting the festival's historical claims. Can I camp on Osheaga grounds? There is no camping at Parc Jean-Drapeau, Osheaga's official site. And there are no hotels in the park. However, downtown and Old Montreal are but a short subway ride away and feature a slew of choice accommodations. For a European feel, try Old Montreal's top 12 hotels. For accommodations in the heart of downtown and Montreal's entertainment district, consider these Montreal festival hotels. For a stay sandwiched between Chinatown and Old Montreal, these hotels near Montreal convention center Palais des congrès are perfect. If money is no object, make a beeline for Montreal's most luxurious hotels. And if aching for style but on a slightly tighter budget, these Montreal boutique hotels fit the bill. Finally, want to be connected to Montreal's underground city? These Montreal hotels are weatherproof. Osheaga usually opens the festival grounds one hour before the first act is scheduled to perform. Depending on the edition, expect to have access to the grounds anytime between noon and 1 p.m.
What am I allowed to bring to Osheaga? Note that all bags are searched. What am I NOT allowed to bring to Osheaga? Osheaga has several vendors selling food (burgers, vegetarian, foodie/exotic, etc.) and drink (alcoholic and non-alcoholic beverages, tea, coffee, etc.). And yes, poutine is available. Smoked meat will probably be as well. A quick note about Quebec's legal drinking age. It's the lowest in North America but nonetheless, ensure to have at least two pieces of I.D. with you for unhindered access to alcohol. Osheaga is not in short supply of bathrooms, portable or otherwise, but soap and toilet paper is another matter. From personal experience, I've learned to bring my own stash of TP and hand sanitizer as hygienic insurance. It's paid off.